LIHUE » The Kauai man accused of beheading a dead Hawaiian monk seal told federal and state officials that he did it for "scientific interest and to preserve it," according to court documents. Justin Freemon, 24, who was in Lihue District Court yesterday to request a jury trial, will appear in court again Monday to learn his trial date. He would not comment but in court documents an enforcement officer from the National Marine Fisheries Service said Freemon admitted to the beheading. Freemon also led investigators to his campsite near Pilaa Beach where he dug up the head that was buried in a plastic bag, according to the documents. He told investigators that he was waiting for the flesh to fall off so that he could study it, the documents said. He also told investigators that he thought the skull would be worth money in the future. At the campsite investigators found a dirty kitchen knife that Freemon said he used to cut off the seal's head, which he told them had been dead for a week, according to the documents. Freemon has been charged with a misdemeanor violation of the National Endangered Species Act as well as intimidating a witness, another Pilaa camper whom he allegedly told about the incident. A Kauai resident found the seal's body on May 1. The maximum penalty for violating state laws protecting marine mammals for a first misdemeanor offense is a $250 and one year in jail. 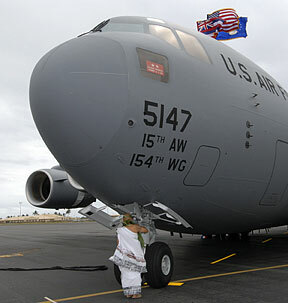 Fifty-six World War II veterans of the 100th Battalion were to be part of the welcoming ceremony today as the Air Force and the Hawaii Air National Guard receive the seventh of eight C-17 Globemaster III cargo aircraft. The aircraft is named Spirit of Go for Broke in honor of the famed 100th Battalion/442nd Regimental Combat Team, the most highly decorated unit of its size in World War II, comprised mostly of Japanese Americans. Two earthquakes, one of magnitude 6.3 and one of 6.1, struck the Aleutian Islands in Alaska today, the U.S. Geological Survey said on its Web site. There were no immediate reports of casualties or damage. The first quake, with a magnitude of 6.3, was at 7:18 p.m. local time in the Rat Islands in the Aleutians, about 1,400 miles from Anchorage, the USGS said on its Web site. The quake struck 41 kilometers below the surface. The second quake, with a magnitude of 6.1, struck in the same area at 7:46 p.m. local time. Its depth was 36 kilometers. No tsunami bulletin was issued. The latest technology and information about hearing loss will be presented June 24 and July 15 at the Hawaii School for the Deaf and Blind. From 10 a.m. to 1 p.m., attendees can enjoy free consultations, hearing screenings, ear examinations and presentations from expert speakers. Breast cancer and nutrition will be discussed in a free presentation from 6 to 9 p.m. Friday at the American Cancer Society, 2370 Nuuanu Ave. Speakers will be Dr. Lisa Grininger on breast cancer and dietitian Heather Knox on nutrition. Those wishing to attend should call 432-9158 by tomorrow . A 23-year-old Hilo woman died early yesterday morning after a Toyota station wagon hit her on the Panaewa stretch of Highway 11. A 72-year-old woman was driving toward Hilo when she hit Julia Nishimoto, who was taken to Hilo Medical Center, where she was pronounced dead at 6:40 a.m.
Police closed one Hilo-bound lane for three hours while they investigated the scene. They do not believe speed or alcohol were factors in the accident and have initiated a standard negligent-homicide investigation. WAILUKU » Maui police said an officer shot a robbery suspect with a Taser gun after the man fled into a sugar cane field and resisted arrest. An off-duty police officer spotted Lance Bailey, 39, at the Kaanapali Royal complex in west Maui about 6:40 p.m. Monday, Capt. Charles Hirata told the Star-Bulletin yesterday. Bailey, of Honokohau, was wanted for questioning in a robbery case. Three police officers went to the complex and one of them saw Bailey leaving the resort and followed him. Bailey drove onto a cane haul road, crashed into a dirt mound, abandoned his vehicle and fled on foot, Hirata said. Officers encircled the area and found him hiding in the brush, Hirata said. Bailey was shot with the Taser when he resisted arrest, Hirata said. Taser guns deliver an electric shock that temporarily incapacitates the target. Bailey was wanted also for an alleged probation violation. Oil and diesel fuel from an overturned tanker truck covered part of Queen Kaahumanu Highway and forced officials to close one lane of traffic on the viaduct for almost two hours yesterday morning. Traffic in both directions alternated using the southbound lane until the highway was cleared and the northbound lane was reopened at 10:15 a.m. The tanker from E.M. Rivera construction company was transporting water about 8 a.m. when it turned right from Hinalani Street onto the highway and tipped onto its side, blocking the merge lane and northbound lane. The 49-year-old driver from Kona was taken to Kona Community Hospital with minor injuries. An autopsy revealed that a homeless Hilo man died Monday from multiple injuries sustained in an auto-pedestrian accident April 1. A car traveling south on Kinoole Street hit 57-year-old George Iopa, who was crossing the road just south of Mamo Street. Police said Iopa was intoxicated and not in a crosswalk. The 59-year-old driver tested positive for methamphetamines but has not been arrested. Police charged a 48-year-old man with robbery in connection with a shoplifting case in which a store security officer was pushed. Police said that on Feb. 22, the security officer, a 49-year-old woman, saw Dean Kalhau hide several items from the Waipahu store and try to leave without paying for them. The security officer confronted Kalhau outside the store and Kalhau pushed her backward and fled, police said. The security officer caught Kalhau and tried to hold him until police arrived but he escaped, police said. Police arrested Kalhau on Monday and charged him with second-degree robbery. He was being held in lieu of $15,000 bail. Police were looking for a couple who robbed a tourist at gunpoint and stole his rental vehicle at the Tantalus lookout in Makiki on Monday. The victim, a 56-year-old man, said the male suspect approached him while pointing a handgun at him and demanded his property about 8 a.m. The male suspect punched the tourist, who was standing next to his car, causing him to fall while the female suspect got into the driver's seat of the car, police said. Both suspects took off in the victim's car, police said. Police arrested a 42-year-old woman who allegedly scratched her ex-husband's vehicle while he was at work on Thursday. The incident took place in Iwilei at about noon. The woman was arrested for investigation of second-degree property damage and later released pending an investigation. Police arrested two men and a teenage boy who allegedly tried to carjack a man but could not start his vehicle this morning. The incident happened in a Honolulu parking lot at about 2 a.m., police said. The victim, 64, said he was approached by one of the suspects, 19, who asked him for money. When the victim refused, the suspect allegedly punched him in the face and took the keys to his vehicle. But the car wouldn't start, police said. At that point the other two suspects, 20 and 17, alerted the first suspect that there were witnesses in the area and all three fled. Police later found the suspects and arrested them for investigation of second-degree robbery and attempted auto theft. Police are looking for someone who set fire to the inside of a car in Wahiawa yesterday morning. The fire started at about 5 a.m. while the car was parked in a garage against the 48-year-old owner's home. Firefighters extinguished the fire that damaged the car; there was little damage to the home. No one was injured and police are investigating the case as a first-degree criminal property damage case. » Lineup changes imminent for U.S.
» KGMB tops KHON at 10 p.m.